The New York State is a home for at least 90 stadiums and sports arenas with the greatest concentration of professional sports teams in all of the major leagues in soccer, baseball, football, baseball, hockey, and lacrosse to name a few. Sports are ingrained into the fabric of New York life. But are we all really safe? If you manage or own a stadium, whether for a well-known team or for local or regional teams, understand that Total Security is on your side. In fact our very own CEO Matt DiMicco can be seen here featured at Yankee Stadium’s HDTV Screen. According to ESPN’s MLB attendance report, Yankee Stadium had a total of 3,193,795 visits last 2015’s major baseball league season. Sports stadiums typically face a unique set of security challenges than regular residential or commercial establishments. Like many shopping malls, sports arenas have an extremely high volume of people passing and exiting through many different doors located around the building. The congregating mass of people, however, are often rowdier than in shopping malls, as they are there to support and cheer on their favorite players. These facilities where fans gather around on a regular basis, have to meet high standards of security measures. The large numbers of people make stadiums susceptible to security and even terror threats, making security managers not only worry about fans getting out of control, but also about the possible serious threats to crowds and players. Stadium management has to set plans to prevent or respond to terrorism and vandalism, protect athletes and employees, separate crowds in case of evacuation, and manage different access authorizations. The design of the building also poses a challenge in designing an effective security program. Stadiums usually have many points of entry and exit to accommodate the sheer volume of people that makes it a challenge for staff to monitor all areas of the stadium. To ensure the safety of everyone inside the stadium, it is first important to assess all the possible security risks and then outline effective safety plans. One of the most common ways security management can ensure the safety of crowd during sporting events is by investing in advanced stadium security systems, such as video surveillance, access control, and intrusion alarm systems. These 3 security systems can help security personnel to be more efficient at handling and responding to threats. Video Surveillance Camera Systems – This type of security system enables complete monitoring, wide coverage, and the ability to record all surveillance elements from a distance and various locations. They help verify or invalidate security threats and alert security personnel of any suspicious behavior. Installing high-resolution security cameras can continuously monitor large groups of people entering and exiting the stadium. They also help identify offenders and any commotion on bleacher stands. In installing video surveillance cameras, it is important to install those that can identify activities in all weather conditions. This will help prevent sports activities from being disturbed by any criminal activity. Access Control Systems – An IP-based access control system is ideal for preventing unauthorized individuals from entering restricted areas such as backstage area, locker, and equipment storage rooms. If installed together with security cameras, this makes it efficient to capture and record all access events. It supports a large range of biometric solutions and visual verification of access cardholders to meet tight stadium security requirements. Any violation of these requirements will automatically trigger an alarm allowing security staff to immediately respond to the situation. Intrusion Alarm Systems – Stadiums face the risk of personal items or sports equipment being stolen from restricted locations. Intrusion alarm devices together with CCTV cameras can decrease theft risk. This type of stadium security system allows monitoring of all doors, parking lot access doors, and restricted areas for unauthorized entry. Once the intrusion detector device picks up unauthorized entry, security staff will then be alerted and apply appropriate response. Taking advantage of the latest security solutions for event venues or stadiums in New York, provides high level of security for everyone as well as allows the management to be more productive and proactive in facing security challenges in a large and fast-paced environment. Solutions from Total Security Integrated Systems can help manage any security and safety challenges for stadiums and sports arenas in NYC and Long Island. Total Security is a full-service security camera system installer with over ten years of experience. We pride ourselves on professional installations and maintenance service of security cameras, video surveillance cameras, alarm systems, and access control systems for commercial and residential buildings. 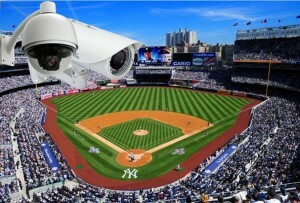 We can help you design, install, maintain and repair almost any type of stadium security surveillance systems. Contact Total Security at (516) 775-2304 for more information. You may also visit us at 206 Hempstead Turnpike, West Hempstead, NY 11552.